In our series so far on the UK’s Fintech dominance, we’ve seen how strong demand for Fintech solutions combined with readily available investment capital is in itself a winning combination. Today we’ll consider the UK’s regulatory ecosystem and infrastructure, and what role it plays in the UK’s number one spot on the Fintech world rankings. This is an interesting perspective because if you look at demand and investment capital, they are very direct influencing aspects, i.e. it is the demand for a specific type of solution that will spark the idea for a Fintech product while direct investment will enable the design, development and launch of that product. A region’s infrastructure and regulations do not necessarily have a direct influence on any one project but play more of a supporting role to shape the overall Fintech attitude and adoption in a specific area. Fintech startups would naturally choose a country with more favourable laws and lenient regulations designed to support innovation, as supposed to an area that restricts and dictates every step that they take. Likewise, an area with advanced infrastructure, including world-class international airports with easy connections to multiple countries, reliable public transport, stable fast and cost-effective internet connectivity, well-maintained road networks and access to amenities, will all play a crucial role in attracting Fintech entrepreneurs. We live in a digital world so many people think the only thing that matters is a fast internet connection, but that is not the case. Although this is important, people still need to live their lives, move around quickly and have access to various necessities and conveniences. Unsurprisingly, the UK is both abundant in infrastructure and a leader in regulation. According to a report by the UK Treasury, Fintech Sector Strategy: Securing the Future of UK Fintech, the government is committed to investing over £1 billion to accelerate the development and take-up of next-generation digital infrastructure. This is on top of an already well-established digital infrastructure. The UK is one of the leading nations when it comes to digital transformation. It is currently ranked 5thout of 79 nations according to Huawei’s Global Connectivity Index (GCI) and is considered a frontrunner when looking at aspects such as Intelligent Manufacturing (expansion of 4G, increased use of industry clouds, IoT and analytics), Intelligent Government (national agencies use big data analytics to make better decisions, detect and prevent fraud, and enhance cybersecurity) and Intelligent Utilities (extensive 4G broadband coverage, self-monitoring and managed assets, big data analytics and product diagnostics to better understand perspective customer bases). Some of the UK-based Fintechs that utilizes the technology groups mentioned above include K Wearables, an IoT (Internet of Things) focused startup that designs and develops wearable payment devices such as the K Ring. There’s Receipt Bank, a cloud-based accounting software that automatically extracts invoices and integrates it with the clients existing accounting software; Clear Bank, the UK’s first clearing bank in 250 years that will utilize the cloud to provide greater agility, transparency and lower fees; and Dopay, a cloud-based automated payroll platform that simplifies payroll processes for finance departments. Bud is a smart app that uses Artificial Intelligence to consolidate user’s services into one platform to allow them to monitor their spending more effectively, while Iwoca is a small business loan provider that uses big data techniques built into its risk model to make the application process fast and flexible. It is estimated that more than 95% of the country will have access to 4G by the end of 2018 which enhances the whole of the UK’s attraction as the go-to place to run a startup. Tech giants like Facebook, Google, Amazon and Snapchat seem to agree and have all made the United Kingdom their home for international operations. The UK regulatory authorities have gone to great lengths to promote and establish a favourable environment for Fintech startups. A report by EY listed the UK as the country with the most favourable regulatory regimes, government programmes and taxation policy. Its Financial Conduct Authority (the FCA) was the first regulator to establish a Fintech Sandbox (defined as “a framework set up by a financial sector regulator to allow small-scale, live testing of innovations by private firms in a controlled environment under the regulator’s supervision.”), an idea that has now been replicated in many countries with great success. Under the FCA’s Project Innovate, startups can enjoy the benefits of a dedicated support team to help them navigate the regulatory environment. The sandbox allows early-stage startups, challengers and incumbents to test innovative products with real customers in a safe consumer environment. Some examples of successful Fintech Startups that took part in the FCA’s sandbox include SETL, a Blockchain-based payment and settlements infrastructure, and Pluto, a chatbot on Facebook Messenger that allows customers to buy and manage travel insurance. Other favourable and forward-thinking regulatory programs in the UK include the world’s first open banking reform, giving Fintechs access to banking customer data, and the bank referral scheme, which makes it compulsory for banks to pass on customers they turn down to alternative lenders. 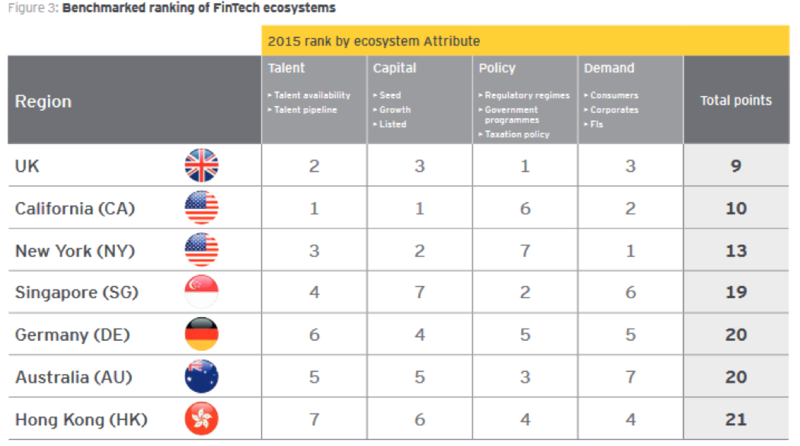 In the next article, we’ll look at what we consider the most important aspect of Fintech success, that is Fintech Talent, something the UK has no shortage of. If you are interested in the full GOV.UK Fintech report, you can download it from here.